Regular verbs follow an expected set of rules when you want to conjugate them into different tenses and forms, and for different subjects. Irregular verbs, by contrast, do not follow the general rules for verb forms. Most verbs add an "ed" for the past tense forms, but these verbs change into different words altogether. While you may see some discrepancies as you work through the variety of verb tenses in English, the challenges associated with irregular verbs are experienced most commonly when working with the past tense and past participle. Download the printable PDF document below by simply clicking on it. It contains dozens of irregular verbs. 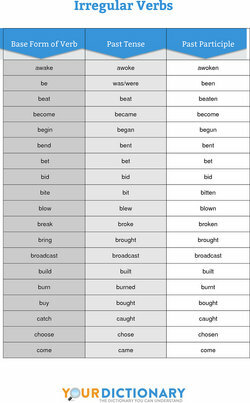 This is a handy reference for some of the most common irregular verbs in English, as well as how to conjugate the base form of the verb into past tense and the past participle. A good way to see irregular verbs in action is to compare a series of sample sentences involving the present tense, past tense, and past participle. He wanted to be the very best, like his father was before him, and his grandfather had been before him. To build her sandcastle, Arya looked at how her brother built his sandcastle after he had built up so much anticipation. Today, we're going to drive to the mall. Yesterday, we drove to the park. All said, we had driven thousands of miles that summer. Her mother wants to grow carrots this year, since she grew turnips last year and had grown so many other vegetables over the years. Sheldon heard the phone ring. And then it rang again. It had rung every day, around the same time, for three weeks. In addition to how irregular verbs do not add -ed to the end of them to form the past tense version, you'll also encounter some other odd rules. Normally, the past tense form of a verb looks different from its base form or present tense counterpart. Even in the case of most irregular verbs, you'll notice a change, like how "come" becomes "came." However, there are a number of irregular verbs that don't change form at all with changes in verb tense. Some May Not Change Form or May Add an "ed"
Even though the general rule of thumb dictates that irregular verbs do not add -ed to the end to form the past tense version, some irregular verbs do, and some require doubling the final consonant before adding the -ed suffix to the end. Using the correct irregular verb makes a difference in how well you convey that you can correctly speak English. These examples of irregular verbs are provided to help you see how each of these verbs is used. By learning the specific conjugation for each verb, your English conversation will sound correct and you can sound more learned. "Examples of Irregular Verbs." YourDictionary, n.d. Web. 23 April 2019. <https://examples.yourdictionary.com/examples-of-irregular-verbs.html>. Regular verbs follow an expected set of rules when you want to conjugate them into different tenses and forms, and for different subjects. Irregular verbs, by contrast, do not follow the general rules for verb forms. Most verbs add an “ed” for the past tense forms, but these verbs change into different words altogether.